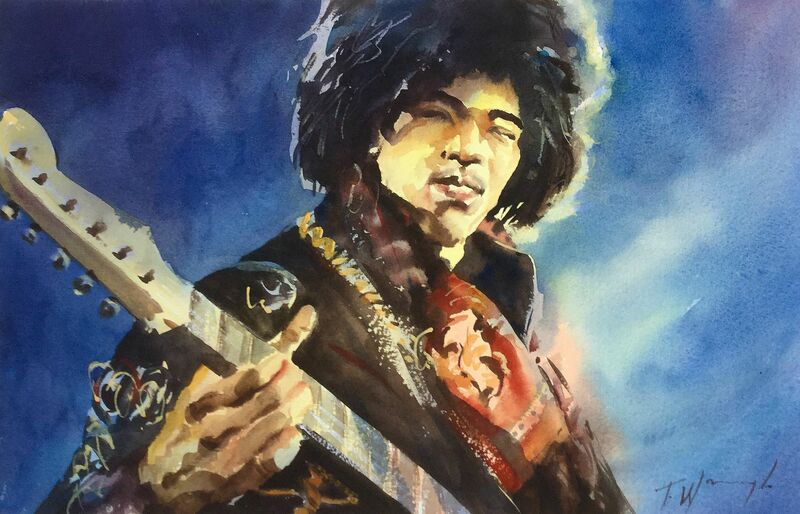 Painted in watercolours a young Jimi Hendrix plays a Fender guitar wearing the appropriate fashions of the era. Boldly painted with a loose but faithful likeness. Rich colourful washes layered and textured in places using this medium to it’s max ! ” I looked at so many images before choosing one to work from, although there are many reference photos to make choices from, there are very few that gave me the scope for improvisation that I was looking for. ” The density of colour is the first thing that comes across in this work, the yellows and blues are a contrast and foil for the dark values.